Bill graduated from Monmouth College in 1964 and went to work for Travelers Insurance Company as an Assistant Claims Manager. He received his law degree from Seton Hall University School of Law in 1972 and was admitted to the bar that year. 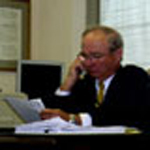 Bill is a member of the New Jersey State Bar Association, the Monmouth Bar Association and was a member of the New Jersey Defense Association. He was involved in the Borough of Sea Girt as a past councilman and insurance adviser and was a member of the Volunteer Fire Department. He is currently the Vice President of the Sea Girt Chamber of Commerce. Bill is our senior trial attorney with extensive experience in personal injury, professional malpractice, insurance, product liability and general civil litigation.